Developers can embed a Waze Live Map on their website. 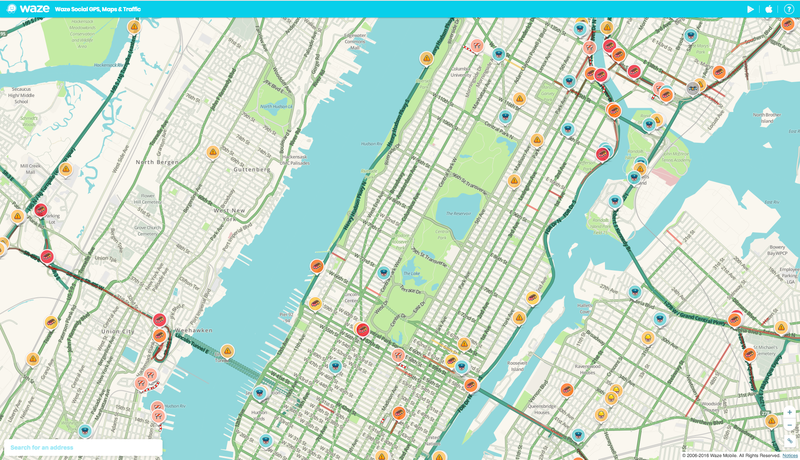 The Live Map lets visitors search for locations and view real-time traffic updates based on Waze's real-time map data. Note: Some functionality described here is specific to partners in the Waze Broadcasters program. Interested in joining our Broadcasters partnership? Apply here. By default, the Live Map includes a link to this map's search and routing options in the lower-left corner. For examples of additional Live Map configuration options, see Examples. Open your web page in a text editor. To generate an iFrame on your web page, add your iFrame code to your web page. Open the Waze Live Map, search for your location either in the search bar or by zooming in and clicking on a specific segment of the map. Click the share icon in the bottom right corner of the map. A pop-up should appear with a customized embed code. Copy and paste the code into the body of your web page. Note: The zoom level of your view on the Live Map is reflected in the embed code. You can modify the zoom level with the zoom parameter. For more information, see URL parameters. The following example shows how to embed the Live Map into your website. Update the URL parameters for your use case. To embed the iFrame into a responsive website, we recommend that you use common CSS techniques to set the iFrame size automatically, based on the screen size. desc Optional Set this parameter to any value to display a descriptive text block in the Live Map. Broadcasters use this text to provide up-to-date information for Wazers, with no need for manual updates to their stations' websites. All text is created by Waze ensuring the content is correct. lat Required The latitude of the map's center point. lon Required The longitude of the map's center point. The level of magnification of the map when it is opened. The minimum value is 3 (least magnification). The maximum value is 17 (most magnification). The default language code is English. For more information, see Localizing the iFrame. Do not associate Waze with use of a non-Waze map in any way. Do not use Waze-branded materials (logo, icons, etc) with non-Waze maps. The following iframe implementation shows the map pin. The following iframe implementation shows the map pin and includes the descriptive text. For additional information and inquiries, get in touch with the Waze support team.